France is planning to host in 2018 a meeting between the countries of the Maghreb and Europe to examine the means of reinvigorating the Union for the Mediterranean. 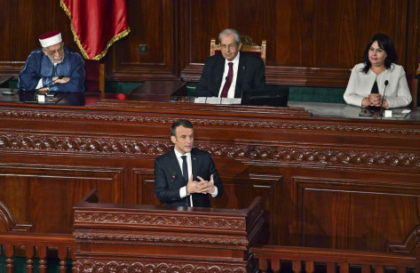 The goal was announced by French President Emmanuel Macron in a speech at the Tunisian Parliament last week. He said that the UfM could not tap into its full potential because its vision of the Mediterranean was somewhat larger to encompass conflicts that acted as a hindrance to the Union’s action. In his speech, Macron seemed to seek a much limited vision for the UfM action narrowed to the western Mediterranean. “between the northern and southern coasts, there is a history, projects, diaspora and youth that are waiting for action,” he said. “If you agree, I would like that France organizes this year a first meeting of the leaders of the civil society, youth, universities of some European countries and the Maghreb countries,” he added. The UfM fell prey to regional tensions and conflicts and its activities were temporary suspended in 2009 at the request of Arab countries rejecting to participate at a meeting attended by Israel.